so that an electron consists of twenty quarks. 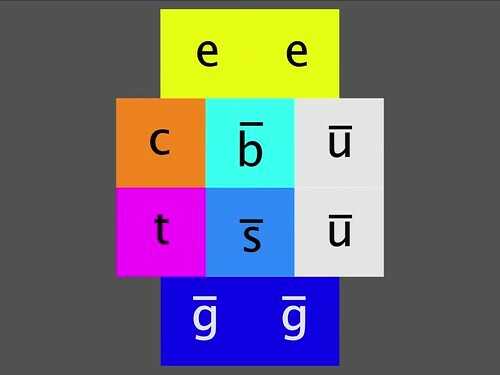 And here is a visual representation of the electron made by combining quark icons. The back row of quarks is the same as the front row. Using these quarks, the mass of the electron is calculated to be 0.5109989280 (MeV/c2). This is exactly the same as the experimentally observed value because adjustable parameters like quark energies have been carefully chosen1 to get this result. For more mathematical detail, please see these spreadsheets. Click on this image for a short movie about the ground-state of an electron. The frame of reference is shown by shading in the background. To illustrate this model, we show quarks with a background that is dark or bright depending on their phase. Then the image above is made into a movie that uses shadows, horizons and background brightness to suggest a quark's relationship with the frame-of-reference. This relationship between quark energies is then used to constrain the selection of other adjustable parameters.